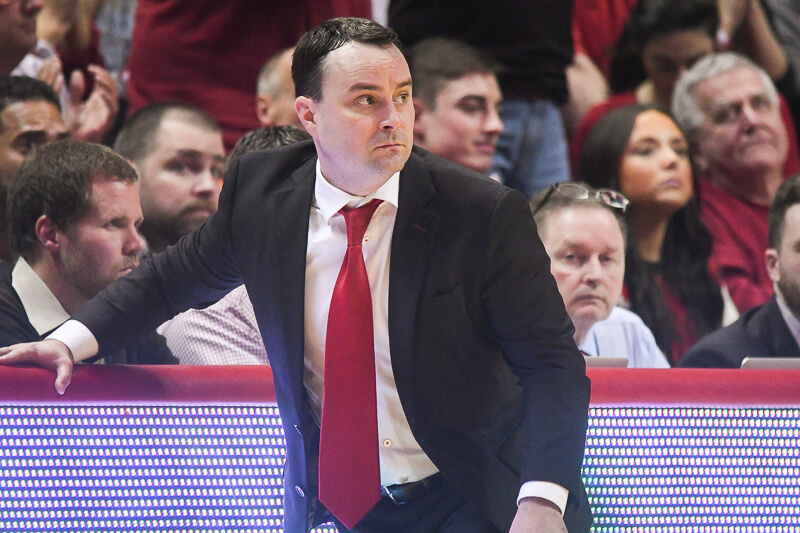 Indiana tips off Big Ten play on Wednesday afternoon against Rutgers at the Rutgers Athletic Center (RAC) in Piscataway, New Jersey. The Scarlet Knights are 6-7 and are coming off of an 89-66 win over UMass Lowell on Monday. Indiana’s performance in the non-conference portion of its schedule was a mixed bag of results. There was good – the offense and the win over Notre Dame stand out. There was also plenty of bad – the team defense, the loss at Duke and the play in Maui. But Big Ten play is here and the Hoosiers received a solid draw with KenPom projecting them as a favorite in their first nine league games. The first of those contests tips Wednesday afternoon with Rutgers, an opponent Pomeroy has as an underdog in all 18 of its Big Ten games. The Scarlet Knights are in season three of Eddie Jordan’s tenure and the results have offered very little encouragement. 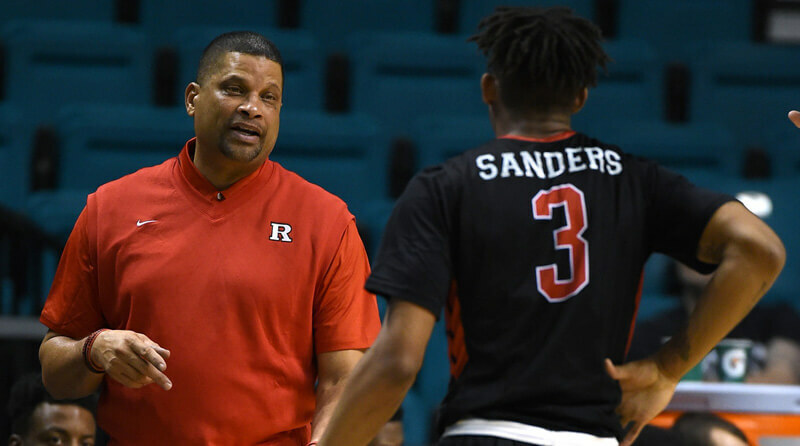 After finishing 10-22 last season, Rutgers is just 6-7 through 13 games and the team is battling major injury issues and a talent deficit that will make winning in the league very difficult. Before we dig into the players that Indiana will see on Wednesday, here’s a quick rundown of what Rutgers is missing entering Big Ten play. The team’s second leading scorer – Deshawn Freeman – remains sidelined with a knee injury and isn’t expected back before mid-January at the earliest. Freshman big man Ibrahima Diallo, who is 6-foot-10, underwent surgery on Dec. 24 to repair a foot fracture. He was averaging 3.8 points and 3.7 rebounds through 10 games. And sophomore Shaquille Dorson has yet to play this season due to a foot injury that has him sidelined indefinitely. So what’s left for Jordan to utilize? Eight scholarship players. The headliner on the scouting report is guard Corey Sanders, a top 100 recruit who was last week’s Big Ten freshman of the week. Sanders is averaging a team-high 14 points, 3.6 assists and 1.6 steals per game. He’s hitting 38 percent of his 3s and has been very effective in pick-and-roll possessions as the ball handler, according to Synergy Sports. In 38 P&R ball handler opportunities, Sanders has scored 37 points, which ranks in the 84th percentile nationally. Joining Sanders in the backcourt are senior Omari Greer, a graduate transfer from Bradley and sophomore Mike Williams. Greer is hitting 57.9 percent of his 3s and is coming off a 22-point performance on Monday night. Williams is a poor shooter (27.3 percent on 3s), but has scored in double figures in five of his last six games. Senior guard Bishop Daniels and freshman Justin Goode are both playing rotation minutes off the bench. Daniels is a high-usage player (25.9 Poss%) who is inefficient. He’s fourth on the team in scoring at 9.2 points per game, but is shooting just 45.1 percent on 2s and 31.2 percent on 3s. Goode has taken just 26 shots in 13 games and statistically is the least productive rotation player. Given the frontcourt injuries, Jordan has just three guys he’s mixing in at the four and five positions. Senior Greg Lewis is the team’s best shot blocker (5.3 block percentage) and the team’s second leading rebounder at 5.2 per game. He’s finishing just 34.4 percent of his 2s, which is a big reason he’s averaging just 3.8 points in 18.6 minutes per game. D.J. Foreman, who is 6-foot-8, starts alongside Lewis and is the team’s best offensive rebounder (8.0 OR%). Foreman averages 7.9 points and 6.5 rebounds per game, which leads the team. The lone frontcourt option off the bench is 6-foot-6 freshman Jonathan Laurent, who is playing close to 20 minutes per game but is being asked to frequently guard players with much more size. Laurent is the team’s best defensive rebounder from a percentage standpoint (21.4 DR%) and is finishing 51.1 percent of his 2s. Rutgers is the worst major-conference team in the KenPom ratings and some of these numbers illustrate why. The Scarlet Knights are 300th in the country in adjusted offensive efficiency at .96 points per possession. Indiana is the nation’s sixth best offense at 1.17 points per trip. Indiana is also the superior rebounding team, does a better job of keeping opponents off the line and forces more turnovers. 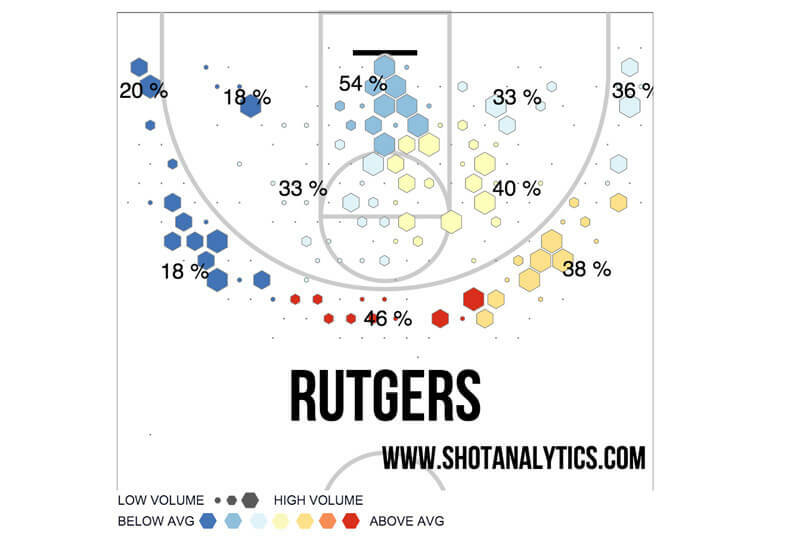 On the plus side for Rutgers, they’ve done a solid job of defending the 3-point line (31.1 percent for opponents), but they’re also allowing teams to finish 59 percent at the rim, which could a bad sign against an Indiana team that basically only shoots from distance or in the paint. If the outside shots aren’t falling, look for Indiana to drive the ball and attempt to exploit the lack of size and rim protection for Rutgers. 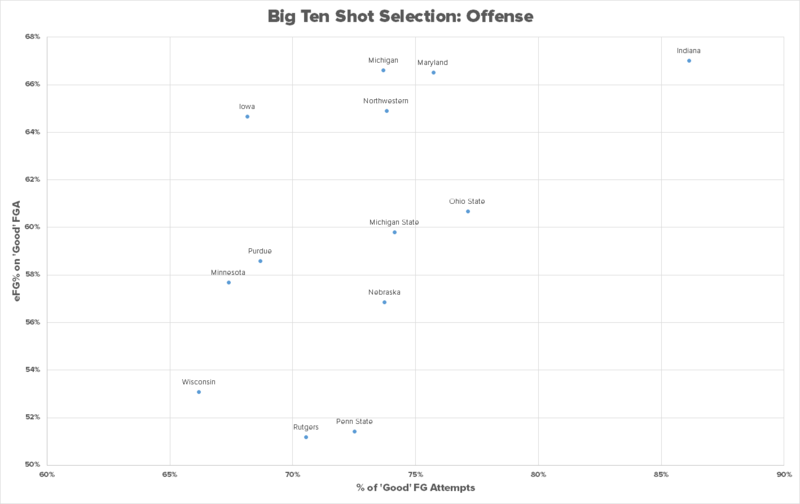 As pointed out earlier in the month by UMHoops, the Hoosiers have the best shot selection of any Big Ten team. The KenPom prediction is Indiana 82, Rutgers 70 with an 87 percent win probability for the Hoosiers. Sagarin is even more bullish on IU in this one and predicts a 14-point win. Vegas opened with IU as a 12.5-point favorite. 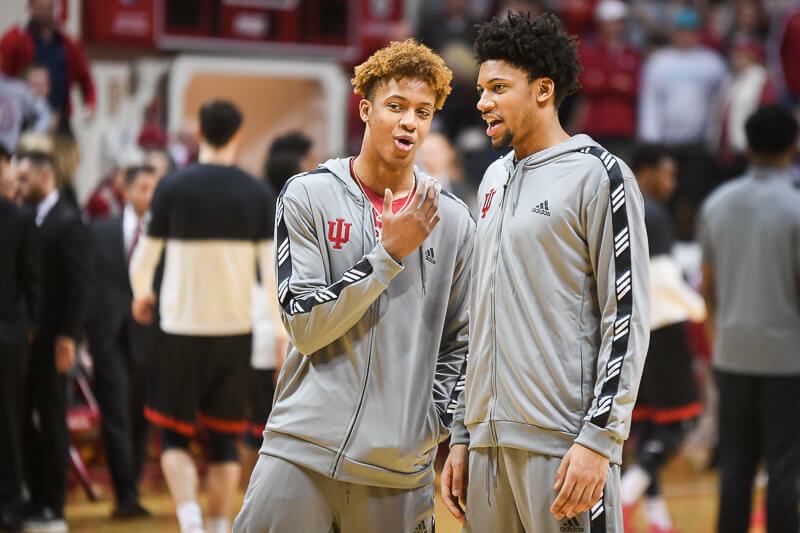 For an Indiana program that has struggled to win on the road in the Big Ten, getting a chance to play the league’s worst team to open is advantageous. Indiana blitzed Rutgers by 30 last season in Piscataway and the gap in offensive production between the two teams is likely to be too much for the Scarlet Knights to overcome. A win would be the sixth straight for Indiana and another boost of confidence heading to Lincoln on Saturday. 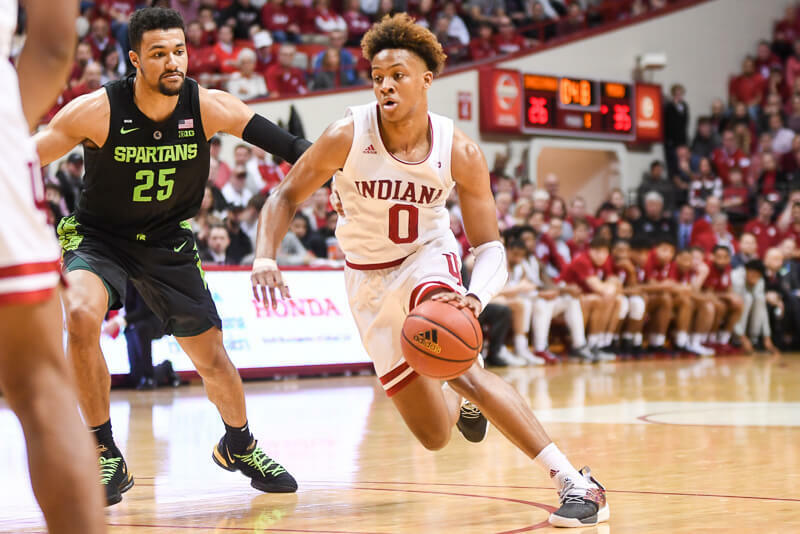 To finish in the top five (or higher) in the Big Ten, the Hoosiers simply must take advantage of opportunities to win away from Assembly Hall. Yuck…this is about as bad as a power conference team can be so there’s really no reason why the Hoosiers can’t get off to a 1-0 start in B1G play if they choose to. You can’t start a challenge for a good conference season without getting this win so let’s hope they can take care of business. I know many of us (myself included) are less than thrilled with much of what we’ve seen on the floor in the past two and a half seasons. My hopes aren’t real high for us to achieve at a level that I would consider commensurate with this roster. That being said, I’m going to cheer and hope with my heart. Maybe the defense can improve a little. Maybe the turnovers can be cut down a little. Maybe our offense can find some consistent success, even on the road and even against decent teams. If those things occur, the schedule certainly appears to allow for a nice season. Who knows? Maybe this ship can still sail to a successful season and for our players sake, I hope that’s the case. I know the coaching staff and our players work hard so I’m hoping against my better judgement that we somehow put it together and contend for a top 3 or 4 spot in the conference and a decent seed in the Dance…hey, a guy can hope. Tomorrow, I’m hoping to see 15 or fewer turnovers, holding Rutgers to under their season average of .96 points per possession, a nice B1G debut for Thomas Bryant and a victory that isn’t in doubt late in the contest. Rutgers would currently get stomped by our 2 preseason opponents, Bellermine and Ottawa. I’ve posted this before but I still just can’t grasp it… How are we so good at offensive rebounding and forcing turnovers but can’t box out on defense or take care of the ball on offense??? We should win this by double digits but I want to see a sense of urgency and pride on defense. 1. Spreading the floor opens the lane for our rebounders to crash. 2. There are longer rebounds because we shoot from a longer distance. 3. Troy Williams, in particular, is extremely active, is hard to block out because he is frequently in motion, and he takes pride in offensive rebounds. Wish I could help with the other questions. From what direction? Get near or in-state and you should be able to find local channels with Don Fischer. IU b-ball and f-ball players on defense are obviously drinking out of the same suspect water supply in the dorms? CC you’ve hit the nail on the head. Nothing to add. Just hoping for the best! We should beat the spread on this one. I know you can’t underestimate any BIG team but…. Not sure what to think of PUke yet. They beat Wisconsin, but they have only played one ranked team and lost to it. Their upcoming game with Iowa will be a better gauge; it will tell us if PUke is a noun or a verb. Iowa just beat a very good MSU team. Yikes. I wonder if Woodbury poked any eyes. They got MSU without Valentine though. We won’t be that lucky. I missed that little detail. Thanks. Of course, he’ll be in top health and with renewed resolved when they play against us. But I think in East Lansing we lose that game anyway, even with Valentine out. Lol, thanks. I know why we are good at offensive rebounding, its the other stuff that confuses me. TuneIn radio app is the best way to listen. Works flawlessly for me every time. Just search Indiana basketball or Learfield Sports. Vanderbilt was ranked when they played and they stomped Pittsburgh in a true road game. Butler beat them but they are legit. I hate it but Purdue is a beast this year. Man… that hurts to type as much as it does saying it out loud. What’s worrying about today’s game isn’t that we aren’t good enough to win, heck, it should be an easy road W. It’s that we won’t play well enough to win. A day game on the road against a team motivated for the upset and easy to take too lightly, could easily become a trap game (remember Wisc last year). This game should be over in the first ten minutes, certainly by the half, but I get a feeling that’s not going to happen. Especially with the lineup we’ve been starting. I don’t think it’s a matter of “can’t” box out, it’s a matter of “not” boxing out. Personally, I just think a few are just so intent on getting the defensive rebound themselves that they forget the basics … like boxing out. I’d like to see the turnovers get under control. That alone means more shots at the basket, and a better chance to overcome a deficient defense. I watched most of their game last night and agree they are very solid. Interestingly they did have a lot of TO’s, but play tough D and are unselfish and fairly patient on offense. Hammons really makes them go, imo. Take him out and they are quite pedestrian, but he erases almost everything at the rim allowing aggressive perimeter D plus he’s a load down low offensively. Unfortunately the Toiletmakers are built to exploit IU’s many weaknesses. My theory is that at least part of the defensive rebounding struggles are due to a desire to “grab and go”. Meaning, we are so intent on grabbing the rebounding and racing down the floor as eagerly as possible so that we can get a quick look on offense that perhaps the players don’t focus quite enough on grabbing the rebound. The thought process skips the entire part about the rebound and immediately goes to “get down the floor quickly so that we can score”. That’s just my opinion and it’s probably not even close to accurate but it looks that way to me at times. You’ve mentioned the starting lineup being an issue on multiple occasions. I’m not criticizing or disagreeing but I’m curious, what do you believe our starting lineup (or primary lineup that sees the most minutes) should be? What surprises me is that Isaac Haas is only getting 16 mins per game. They must have bent over backwards for Swanigan, who is getting the most mins at 27. He’s a good rebounder but apparently a turnover machine. Yeah, I think we’re on the same page. They want the rebound (to start the fast break), but don’t do the fundamentals (blocking out). It’s a self-defeating mind-set, IMO. Of course we play at MSU… on Valentine’s Day. Haas’ conditioning is probably still an issue for him. He is very big and running up and down the court can be a task for a giant. Swanigan is like most freshman who play a lot of minutes and have the ball in their hands… Turnover city. He had 7 turnovers against Butler, but also had 25 points. They seem to go as Hammons goes. Much like Troy for us. IU will play better D and have a field day inside. Look for Nick and the others to take up the slack from JBJ being out.